`Curioser and curiouser’ as Alice might have said is the myth behind the story of Lawrence of Arabia. T E Lawrence – or as William Boyd reminds us in his fascinating programme note, `Chapman’, not `Lawrence’ – took on many forms, Aircraftsman Ross being just one and later, alluded to in Howard Brenton’s recent Lawrence After Arabia (see last month’s Hampstead review), Private Shaw. 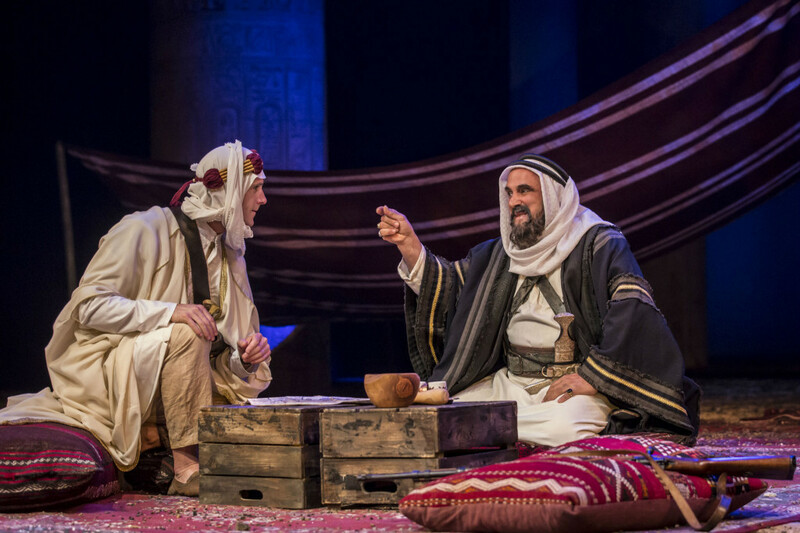 Coincidence or serendipity that brings Rattigan’s 1960s play into conjunction with Brenton’s more revisionist view on T.E’s desire to `disappear’ after his desert escapades, perhaps simply it is 2016 being the centenary of the Arab Revolt that brings them together. Whatever, they make a fascinating pair. 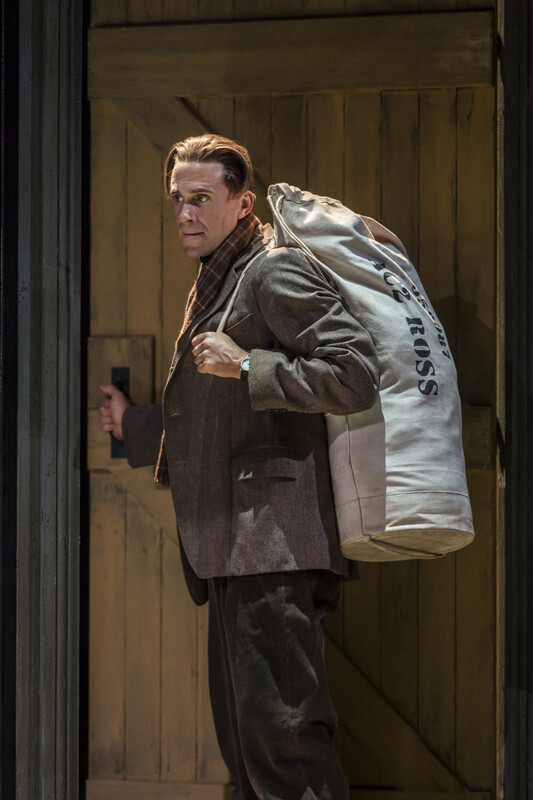 And though Brenton’s is a more sideways glance, Rattigan’s Ross certainly stands the test of time – at least it does in Adrian Noble’s handsome revival taking full advantage of Chichester’s wide open stage. William Dudley’s dominating, hieroglyphic inscribed pillars (referencing Lawrence’s writings and archaeological interests) frame a richly detailed production that never lets us forget a culture manipulated by Britain, with the connivance and passion of Lawrence, that, by implication, has contributed to the morass that is the Middle East today. At its heart, winningly played by Joseph Fiennes – charismatic and haunted – is Lawrence himself, book-ended by Rattigan skulking away in the RAF but at the end, when exposed by his fame, catapulted out. In between in this all-male world, flashbacks run through the by now well-known events chronicled by Lawrence, aided by newsreel clips. 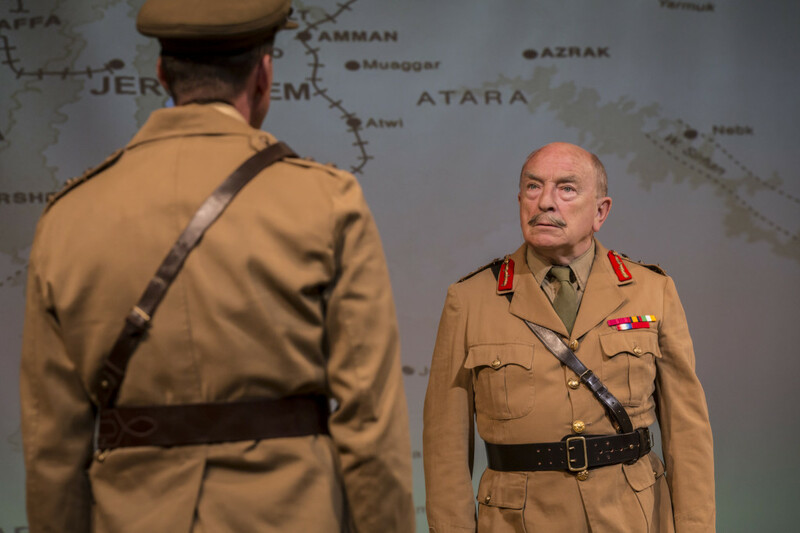 A play of opposing personalities, sparks fly between Paul Freeman’s General Allenby, all soldierly necessity and Fiennes’ scholarly complex celebrity, at once flamboyant, ambitious and ever so slightly retiring. Given Rattigan’s own personality, he shows a gnawing sense of guilt and shame lying at the heart of his eponymous hero and a Turkish Governor (played with fiendish relish by Michael Feast) on hand, like a demonic inner conscience, to give Lawrence, through torture and physical humiliation, a lesson in self-knowledge. Crisply accurate – watch how those RAF recruits drill to Brendan Hooper’s barking Flight Sergeant – Ross does nothing to puncture or reduce the Lawrence myth but still makes damned good theatre. 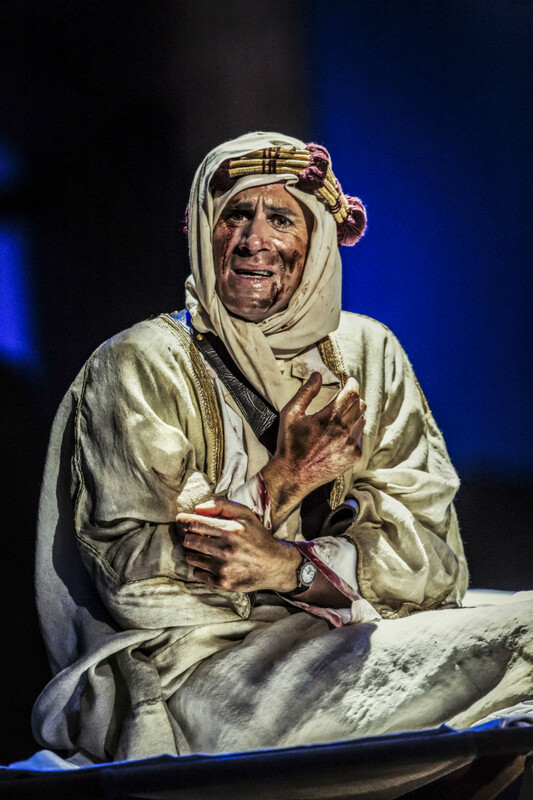 This entry was posted in 2016, Reviews and tagged Adrian Noble, Britain and the Middle East, Chichester Festival Theatre, howard brenton, Joseph Fiennes, T E Lawrence, Terence Rattigan, William Dudley, WW1 on June 14, 2016 by Carole Woddis.